Oh, hello. I didn’t smurf you come in. Sit down, relax and smurf up a chair. I could do that all day, but I won’t. Chances are, if you’re anything like this monster, you haven’t seen a Smurf since you yourself were only three apples high. So you may head along looking for a little blast of nostalgia, or you may have a few little people of your own and a Saturday afternoon to kill. Either way you could spend it at worse films. 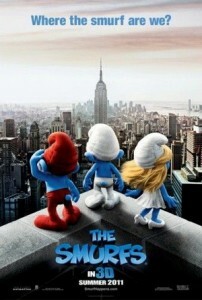 The Smurfs follows the eponymous blue rascals as Clumsy Smurf (Anton Yelchin) accidentally traps a handful of Smurfs and Gargamel (Hank Azaria) in New York City. They then have to wait for the next blue moon in order to reopen the portal to bring them home, with a little help from Patrick and Grace (Neil Patrick Harris and Jayma Mays). Wackiness ensues. Yes, it’s formulaic. Yes, the cartoon character trapped in our world has been done to death. Yes, children will still flock to see it. Director Raja Gosnell doesn’t turn the kids summer movie on its head with The Smurfs, in fact it couldn’t be more by the book, but the book works and that’s why it’s the book. The movie is kept treading water by its cast. NPH’s marketing VP makes for a very relatable everyman, struggling to make sense of his world-turned-upside-down by Smurfs. Jayma Mays provides her trademark breathless-sweetness, while Hank Azaria serves as the completely OTT, mad-cap Gargamel. The voice cast isn’t bad, but at times you can’t help but feel that the Smurfs could have had so much more to do and say… and not say (Katy Perry). The film makes nice use of the 3D tech available to it and remembers that 3D is supposed to be fun and not a means of adding gravitas to your movie (James Cameron). The effects break the fourth wall and will keep kids giggling/shrieking/what-have-you, while the smurfs themselves look great in the extra dimension. There are of course some big problems with the film: Where were they trying to go with Sofia Vergara’s character? Is it just me or does NPH look a tad uncomfortable carrying the movie? Katy Perry. To name but a few. This is aimed at kids and anyone going in with higher expectations will be sorely disappointed. The few adult-pitched jokes should keep parents awake, but be advised it’s not for you. Critics will rail about it, kids will love it, I plan on getting on with my life.